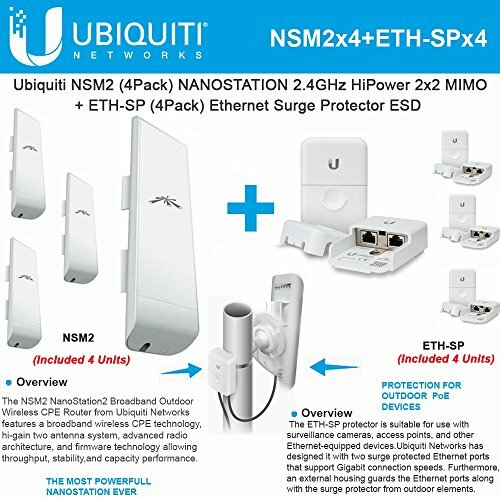 Ubiquiti NSM2 (4-Pack) NanoStation M2 Featuring a panel antenna and dual-polarity performance, the NanoStation M is ideal for Point-to-MultiPoint (PtMP) applications requiring high-performance CPE devices with a sleek form factor. Ubiquiti NanoStationM2 2.4GHz 11dBi 2.4GHz HP 2x2 MIMO 150+ Mbps AirMax TDMA Station. NSM2 is the MOST POWERFULL NANOSTATION EVER. NSM2 features 11dBi dual-polarity gain at 2.4GHz. The ETH-SP (4-Pack) is a cost-effective solution for protecting outdoor Ethernet devices from damaging electrostatic discharge and surges. ETH-SP is engineered to protect any Power?over?Ethernet (PoE) or non?PoE device with connection speeds of up to 1 Gbps.